Special Roosevelt Island Operating Corp Board Of Directors Meeting For August 4 To Appoint New RIOC President - Will Only 1 Candidate Be Considered? Just received this message that a special meeting of the Roosevelt Island Board of Directors will take place on August 4, 2010 5:30 PM at the Good Shepherd Community Center. On the Agenda for new business will be the appointment of a new RIOC President/CEO. The only candidate listed on the Agenda for consideration to be appointed RIOC President/CEO is Leslie Torres. gives the public a role in the process of hiring the RIOC President—requiring the Board of Directors to consider at least three candidates for the job and to hold hearings allowing members of the public as well as Board members to interview the candidates. to be ignored in the selection of the new RIOC President/CEO. If it is the case that only one candidate is being considered, not a good way to start off the post Steve Shane RIOC administration. Roosevelt Island Riverwalk Condo & Rental Development In The News - Did You Know We Are Suburban? ... she hopes Related and Hudson never construct the final three buildings across Main Street. "Then I might move," she says ruefully. "It would start to feel too crowded, too much like across the river in Manhattan." The Roosevelt Island Operating Corp (RIOC) a state Public Benefit Corporation which manages, runs and funds all that goes on at Roosevelt Island, without money from the State or City for it's operating budget, is counting on projected revenue from these projects to finance future necessary capital projects. So if Riverwalk Buildings 7 -9 don't get built, RIOC will have to do some scrambling and find some other way to raise capital budget funds. As I was walking by the Roosevelt Island F Train Subway Station last night, I was pleasantly surprised to discover what looked like a new transportation option for tired Roosevelt Island commuters on their way home or Riverwalk residents on their way north. Would Pedicab bicycle rickshaws be a new alternative to the Red Bus and walking? What a great way to get around Roosevelt Island. I thought whoever came up with this idea was a genius! My enthusiasm increased when told by the very nice pedicab driver that the ride was free but I quickly realized that this was too good to be true. And it was. 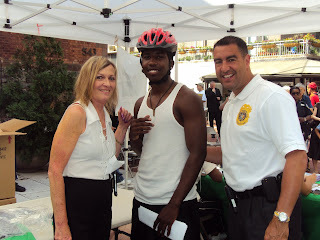 Turns out the pedicabs were there to take real estate brokers and agents to a Manhattan Park event. Cowabunga Dude - Roosevelt Island Outdoor Movie Series Presents Teenage Mutant Ninja Turtles At Firefighters Field On Saturday July 24 - Awesome! 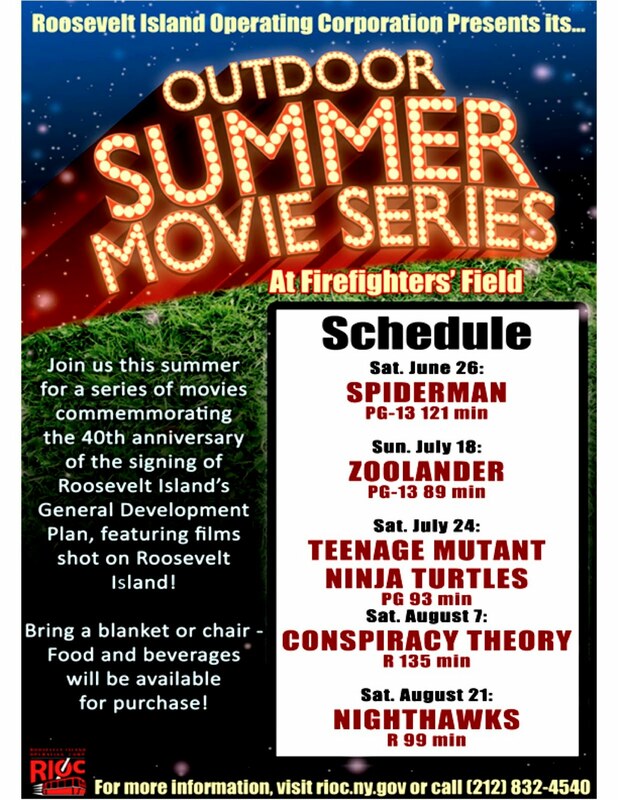 The Roosevelt Island Outdoor Movie Series continues on Saturday, July 24 with the showing of our favorite half shelf heroes, the Teenage Mutant Ninja Turtles at Firefighters Field beginning at approximately 8:30 PM. 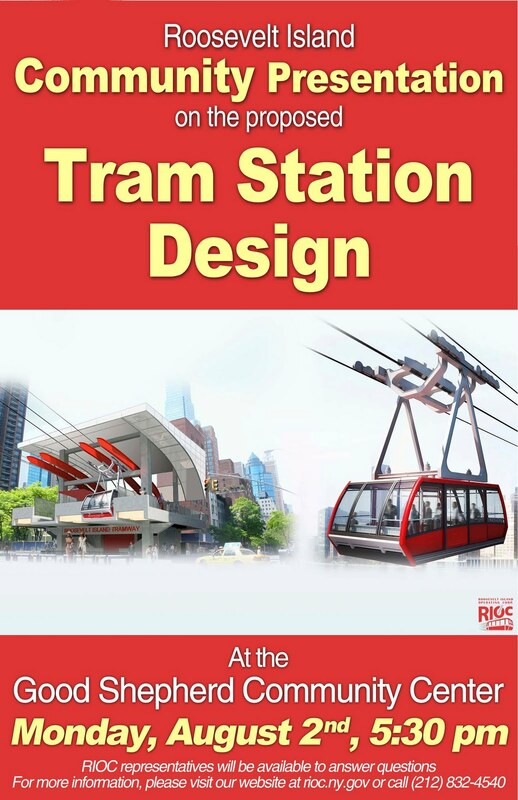 The Roosevelt Island Operating Corp (RIOC) Board of Directors Operations Committee will be meeting on July 26 to discuss the Roosevelt Island Tram Station Design improvements. PLEASE TAKE NOTICE that a meeting of the Operations Advisory Committee of the RIOC Board of Directors will be held on Monday, July 26, 2010 at 5:30 p.m. at the RIOC administrative office, 591 Main Street, Roosevelt Island, New York. 1. Presentation on the Tram Station Design Improvements. ... Mr. Shane provided a brief background of the Aerial Tramway Modernization Project. He reminded the Board that this project, with an overall cost of $25 million, is being funded with $10 million from RIOC and $15 million from New York State. Mr. Shane noted that the overall project is running on schedule and that the current budget balance for station improvements is approximately $3,470,000. He further noted that RIOC proposes to hire BL Companies, originally retained as a subcontractor by POMA, to perform the station design work on a sole source basis because of their previous involvement in the Project. Mr. Shane then invited Ms. Wilpon of BL Companies to present her firm’s design concepts. Ms. Wilpon discussed the scope of work, explained the designs and provided a description of the materials to be used for station improvements. She further discussed the issues of station lighting and passenger protection from the weather elements. In response to Ms. Christian’s question, Ms. Wilpon noted that accessibility of the stations would remain the same, though some repairs would be made to the elevators. She explained that the current budget does not allow for the installation of new elevators. Mr. Shane further noted that the stations will be ADA-compliant. 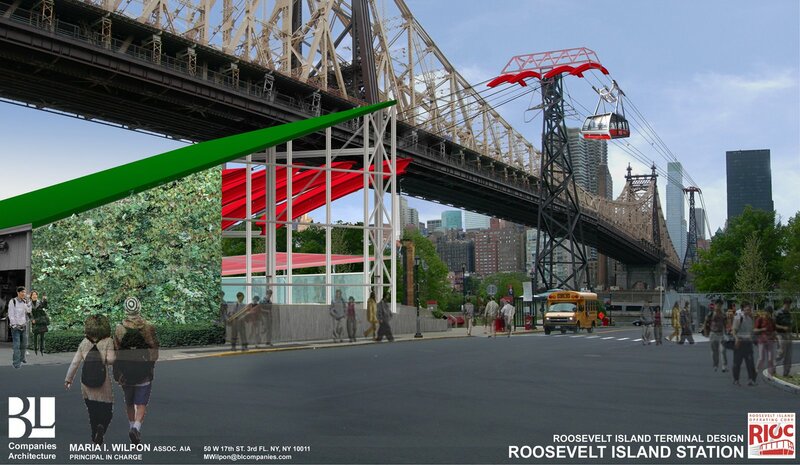 At one time a Green Roof/Siding was being considered for the Roosevelt Island side Tram Station. It will be interesting to see what the new design for the Tram Stations look like and how they will function for the various special needs users on Roosevelt Island, the elderly, disabled etc. 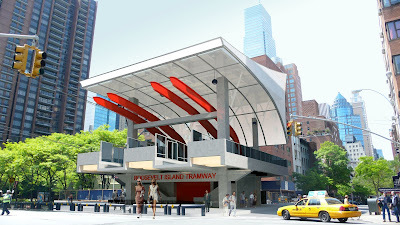 Also, what will the Manhattan Tram station neighbors think of the new design? Last year, they were not very happy with the design presented to them and wanted their own green roof for the Manhattan Station. 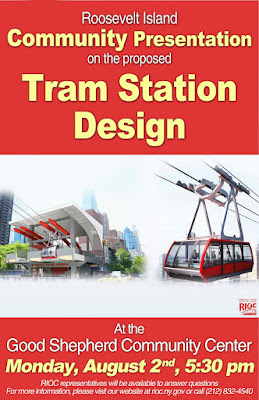 More on Roosevelt Island Tram Station designs from earlier posts. Please be advised there will be a special community presentation of the proposed Tram Station Design on Monday, August 2nd, 5:30 PM at the Good Shepherd Community Center. Representatives will be present to answer questions. But that did not work out. UPDATE 7/23 - Several readers have suggested that the Tram Community Presentation on August 2 be moved to another location because of the stifling heat at the Good Shepherd Community Center caused by lack of air conditioning. I asked RIOC VP of Planning and Governmental Affairs Rosina Abramson if the site could be changed and she is looking into it. Will let you know what happens. UPDATE 7/27 - Audio webcast of the Operations Committee meeting is now available. 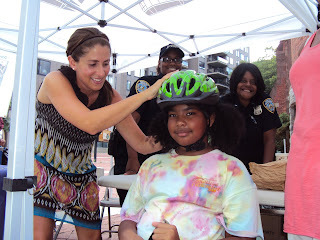 On Tuesday, July 20th, the Public Safety Department Co-Sponsored its 2nd Annual Bicycle Helmet Day with SafeKids NYC. 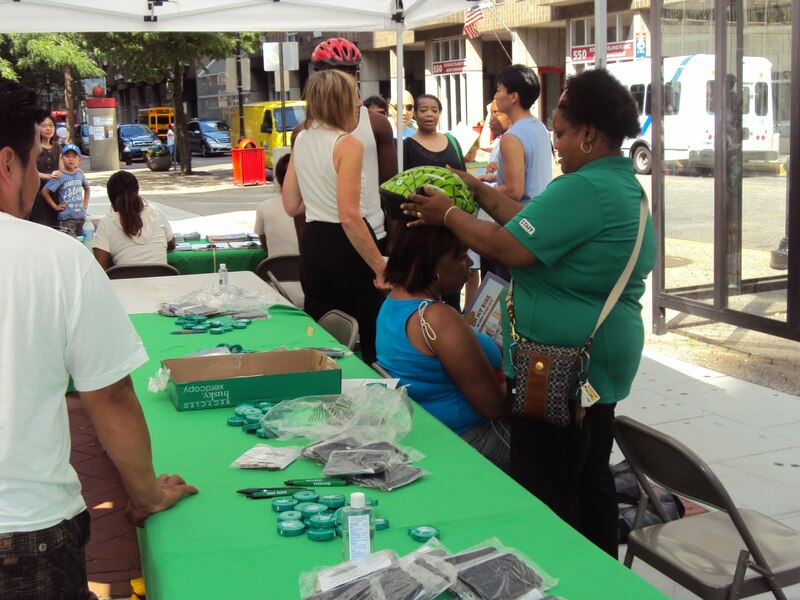 Volunteers from DOT assisted with the fitting and distribution of 360 Free Bike Helmets on a beautiful Summer day. PSD Officers were on hand to meet and greet the residents and provided refreshments to all the patient people who waited in line. 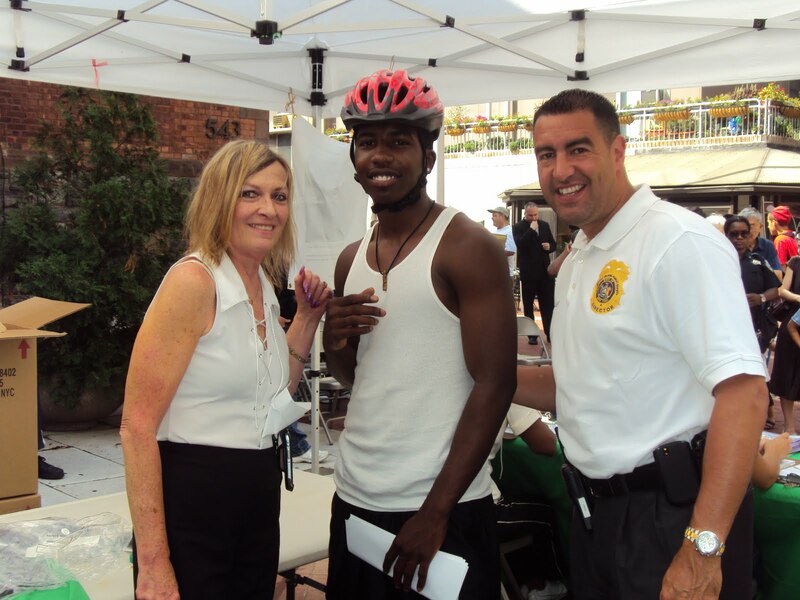 Cheryl Johnson from DOT was quoted as saying, "This was the 1st time that we actually ran out of helmets." This event is such a hit with the Roosevelt Island Community that the Public Safety Department vows to have one every year. So please, wear your helmets while riding and encourage the kids to wear theirs as well. Excellent program - please remember to Bike Safely. Once upon a time, visitors who arrived on Roosevelt Island by subway found no directional signage for sites and attractions here. Through the MTA New York City Transit Neighborhood Institutions Directory Program, the latest addition to the Roosevelt Island subway station addresses this gap. The Neighborhood Institutions Directory lists several destinations of interest, and others will be added. The program is designed to help people find destinations that are within walking distance of the subway. Eligible institutions are hospitals, schools, tourist destinations, nonprofit organizations, police and municipal services. Administrators of these institutions submit an application to MTA NYC Transit; and, upon approval and payment of a one-time fee of $200, a plaque is produced and installed. "Many residents and visitors have noted the lack of directional signage at the subway station and at the tram plaza. 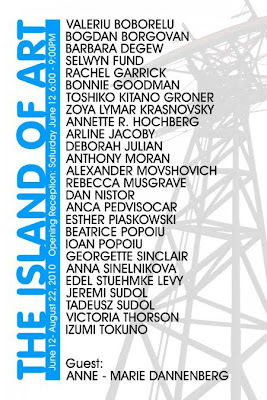 The Neighborhood Institutions Directory represents a significant improvement that we hope will be followed by signage at the tram," said Judith Berdy, president of The Roosevelt Island Historical Society (RIHS). Janet Falk, a volunteer with the Society, arranged a meeting with Judith Berdy and Cynthia Ramos, deputy director of Client Services at MTA NYC Transit. Upon inspection, it was agreed that MTA approval would be sought to include a Neighborhood Institutions Directory board as one of the five panels of the Customer Information Center in the Roosevelt Island subway station. The RIHS contacted the groups that seemed most likely to benefit from a listing in the Directory and submitted a request for the Roosevelt Island Visitor Center Kiosk. PS/IS 217 and RIOC also signed up. Goldwater and Coler Hospitals, and The Child School are considering participation in the program. Because of their status as landmarks, The Smallpox Hospital, Strecker Memorial Laboratory, The Blackwell House, The Chapel of the Good Shepherd and The Lighthouse are also eligible for listing in the directory, as are the parks -- Southpoint Park, Blackwell Park, Firefighter's Field, Capobianco Field and Octagon Park. The New York Public Library and Gallery RIVAA may also be eligible, according to Cynthia Ramos, Deputy Director, Client Services, Marketing & Service Information at the MTA. The Directory can accommodate at least 10 plaques, so there's room for some of these destinations to be listed. If your nonprofit group is eligible and you wish to participate in the Neighborhood Institutions Directory Program, please contact the RIHS at rooseveltislandhistory@usa.com or 212-688-4836, for more information and the MTA NYC Transit brochure, which includes an application. Good job by Ms. Falk and Ms. Berdy in working with the MTA to get this accomplished! 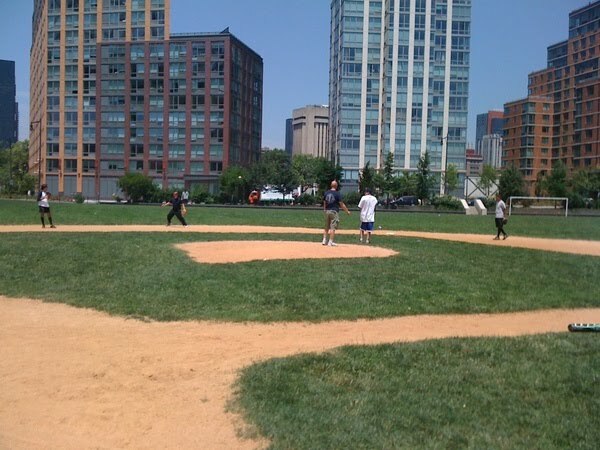 What ever happened to the two Roosevelt Island baseball teams in the little league tournament? Special Correspondent Charlie De Fino, Executive Director of the Roosevelt Island Youth Center reports on how our Little League teams did this summer. Last Friday in 90 degree heat our Junior team (13-14) lost to West Side 11-7 in a game we were leading 2-1 in the fourth inning behind very strong pitching, a couple of misplayed balls opened the gates for 6 unearned runs and that was too much for us to recover from. We have to remember this is our first time in over 10 years that we have entered the tournament and we entered it with 3 teams in separate divisions, many more established leagues choose to focus on one division and try to win, we choose the experience. So our 9 & 10 group went 2 & 2 and one of the teams we lost to won their division and went on to win a sectional game against Throggs Neck, our 11 & 12 were clearly overmatched in talent but not spirit and lost two games including one in which they came back from a 8 run deficit to tie the game and were inches away from winning it but as fait would have it we lost. This is not the end, we will begin our Baseball academy for pitchers and catchers in November and get ready for next year, with a few free agent additions ( a family with at least 3 good players moves to the island) and some additional volunteers to help coach we will be in the hunt. For those Basketball fans our Summer league in collaboration with RIOC is now being held Mon, Tues and Wed (6:30PM and 7:45PM at Blackwell park, come by and see some good games. For a schedule call the Youth Program at 212-935-3645 between 9AM and 9PM for information. Former Roosevelt Island Operating Corp President Steve Shane Talks To The NY Times About His Removal By RIOC Board - They Defied Governor He Says! In my opinion, the Roosevelt Island Board of Directors did the right thing and the only thing they could under the circumstances. Mr. Shane worked for and under the Board - they did not work for him. In the past, the Roosevelt Island Board of Directors was more often than not a mere rubber stamp for the wishes of the current President. This current Board is different, independent and composed of members very knowledgeable about the issues facing Roosevelt Island. 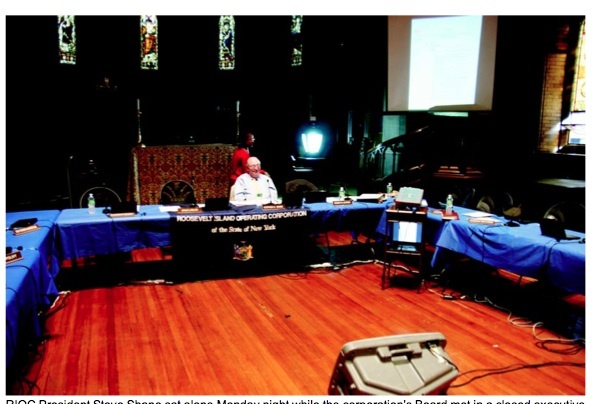 Mr. Shane is also very knowledgeable about Roosevelt Island issues (unlike recent RIOC Presidents), but in day to day practice, I believe he could not abide by an independent Board of Directors that advocated policies he disagreed with. The Board of Directors had no other choice than to remove Mr. Shane because Mr. Shane continued to publicly oppose policies that the Board had approved and he would not stop being defiant. Whether you agree or not with the Board's decisions on the Main Street Retail Master Leaseholder, Mitchell Lama Privatizations or any other Roosevelt Island issue, it is their decision to make, not the RIOC President's decision. Once a final policy decision is made by the Board, it is the RIOC President's job to implement it, not publicly oppose it. If a RIOC President thinks the decision is so terribly wrong, after appealing to all appropriate administrative channels, the proper recourse would be to resign and then publicly oppose it. Perhaps Mr. Shane can explain why he did not do this? No business or government entity can operate effectively when the CEO/President is defiantly opposing the policies of it's Board of Directors openly and in public. Mr. Shane, who I acknowledge was a far better RIOC CEO/President than any of his most recent predecessors, paid the price for refusing to acknowledge that the RIOC Board was in charge of Roosevelt Island policy issues, not Steve Shane. It is also highly unlikely Mr. Shane is correct in saying that the Board defied the Governor or that Mr. Shane was removed without the approval of the Governor since DHCR Commissioner Brian Lawlor, himself appointed by the Governor, was present at the June 28 Board Meeting in which Mr. Shane was removed. The RIOC Board of Directors, including Mr. Lawlor, could help clear up precisely why Mr. Shane was removed if they would speak publicly about what occurred. When I have asked them repeatedly to do so, they have declined saying they this is a personnel matter and they are prohibited by law to comment on the matter. 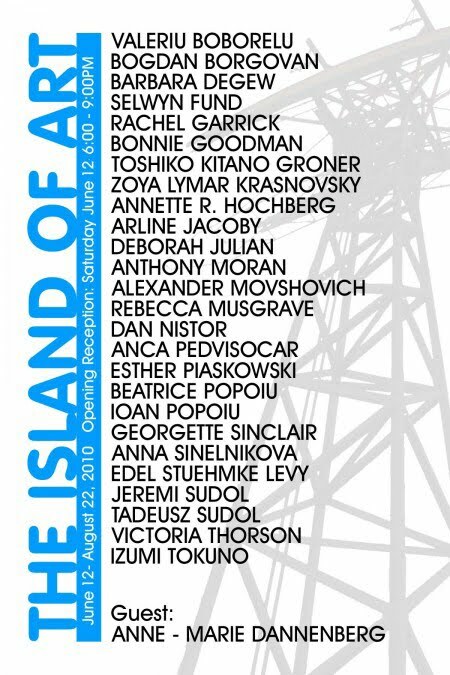 Perhaps now that Mr. Shane has gone public, the RIOC Board of Directors will share with the Roosevelt Island community the reasons for their actions. The NY Times article also quotes Mr. Kraut saying that the Board Members have been told that Deputy DHCR Housing Commissioner Leslie Torres may be appointed the new RIOC President. A webcast of the June RIOC Board meeting is available here. It is usually removed a month after the meeting so if interested, watch it soon. The Tower Top was removed today. The Tower Side Arms are still waiting to be taken down. 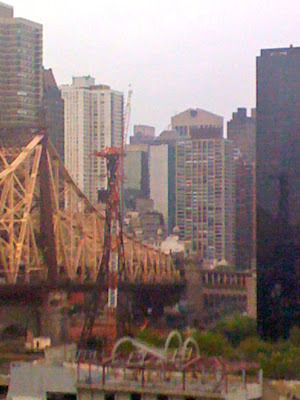 Last look at the old Roosevelt Island Tram Tower Top from last Friday. More information on Roosevelt Island Tram Modernization Project available from earlier posts. UPDATE 10:40 PM - Roosevelt Island Historical Society President Judy Berdy sends in these photos of the Tram Tower Arm being taken down from Tower 1. More pictures from Ms. Berdy of the Tram Arm coming down from the Tower. On Tuesday July 20th from 3:30 p.m. to 6:30 p.m. the Roosevelt Island Public Safety Department is Co-Sponsoring with SafeKids, NYC the Second Annual Bicycle Safety Day at the Good Shepherd Community Center. We will be giving out Bicycle Helmets to anyone wishing to receive one. 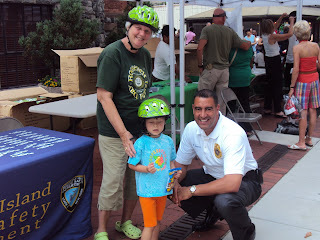 If under the age of 18, they must be accompanied by a parent to receive a helmet. Last year 244 helmets were given out to the community. We were playing softball on Saturday, as usual. At 9:00 AM, one East-West row sprinklers were running, on the far side of the field from the diamond. Usually, we can share the Firefighters Field with soccer players but they were pushed too close to us in the earlier morning by the sprinklers so we got to a late start. Every so often (15-20 minutes? ), the sprinklers switched to a closer row. By 10:15, shallow right field was being sprayed. By 10:45, mid-game, the infield was under assault. I saw a pair of RIOC red-shirts changing trash bags and I approached them. They told me that the sprinklers are now on a timer and will be on at the same time every week. They agreed that it is ridiculous to water the field at a time of day when the field is most likely to be used. They told me that they could do nothing because the sprinklers are controlled by "Maintenance" and that this department doesn't work on weekends so there was nobody to call for an immediate resolution. ... I hope that the quick and easy-to-implement solution is for RIOC to change the timer. I'm no expert but what's wrong with the middle of the night? (Note: The times are not precise). Firefighter's Field has 14 zones. Each zone is on for about 15 to 30 minutes. Basically, it will take 3.5 to 7 hours to water the entire field. We have adjusted the timer to start at mid-night in order to complete the watering of the field by no later than 7am. I checked back with the Softball group this past Saturday and learned that the sprinklers did not go off during their morning game. Good job by RIOC, Mr. Martinez and RIOC's maintenance staff in responding quickly to a resident's problem and resolving it to everyone's satisfaction. More information on the Roosevelt Island Saturday morning pick up game available at their Meetup Group site. Players of all skill levels are welcome.